If you like to build websites using Bootstrap and your next project is a new eCommerce site for one of your clients, this time’s template collection might help you save some time. In this article we’ll take a look at 10 premium eCommerce Templates made with the Bootstrap framework that come with many features, ready to use elements and with the latest web development techniques. * Note: This article contains affiliate links which means that if you click on these links and buy the theme, I might get a commission. Unishop by rokaux is a 100% responsive template based on Bootstrap 4. It comes with more than 25 components, including flexible elements, numerous page options and designs. This makes it a all-in-one template that will give your online store a jump start. The code is clean and it comes with Node.js, Grunt, Pug, jQuery, Sass and Bootstrap 4, for those of you who like to have a say on your website down to the smallest detail. Designing new pages is simple and quick and the unique product display is truly something else. It is designed specially for this template, too. The Mega-menu gives you plenty of options to work with and the specific pages (Blog, Home, Secondary pages) will help you create the perfect buyer-friendly store. But the best feature is definitely the Interactive Credit Card checkout, which will save time and effort for the buyers. Along with that, there are also shop pages. Now these are really useful and practical. There are product details, checkout, cart and quick view, all of which create a much better experience for the user. The Dashboard is neatly organized so everything is easily accessible and the 3-step checkout process lowers last-minute buyer withdrawal. Also included are 20 UI elements, which make working with and building new pages time-efficient. And that’s not all! With over 700 icons, numerous fonts and scroll animation, BigBag Store is a very well-designed theme. M-Store is also designed by rokaux and if you are a fan of simplicity, this is the template for you. In a clean and minimal design, it has a very modern look that is appealing both to the user and the visitor. Whether you’d like a single view of a particular product, or several ones placed together, it can easily be done. The Multi Product versions, along with the Single Product Shop will help you accomplish that. It is a developer-friendly template too, so you can get your hands in the code and work your magic. There are 3 Header versions, as well as 3 Front Page variations to choose from. When it comes to specific pages, they can easily be created and there is also a Blog option. A layered PSD is included and the 6 Shop Catalog variants give you plenty of creative space to work with. The code is heavily commented and the template itself is lightweight and comes with optimized graphics for all devices. OurStore by InfiniteLayout is a versatile template for creating an incredible online store. There are numerous features, such as a Mega Menu in two versions, 6 Home Pages and 6 different Layouts to choose from, Google fonts and over 33 Html pages. It is based on Bootstrap 3 and comes with a very well-documented and clean code to work with. The design is fully responsive and easily adjusts to any device, so visitors can access your store from anywhere. The numerous page options will make it easier to categorize all of your products and give buyers various options to interact with your site. All of this intended to help you create the best eStore and get your online business on a new level. Designed by gtanim, BootClassified is a modern template, rated as the #1 classified template on WrapBootstrap. In a fully responsive design and RTL ready, it accommodates visitors from all around the world. There are various things to look at, such as the Job Board, SVG Map, detailed Categories and plenty of other pages. These can be easily customized and created by utilizing the numerous UI elements included. This is a great template if you are not only looking to sell small products, but want to launch a Real Estate business or a Car Sale/Rental one. The SVG Map helps visitors quickly access products that are near them, saving their time and lowering costs. The code is clean, developer-friendly and comes with support, if you should need it. 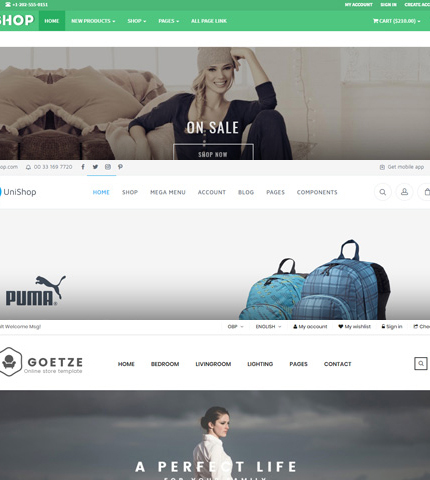 Goetze is an eCommerce template by HasTech that is user-friendly. Whether you are a developer or a newbie looking to set up shop, this is a design that will come in handy. There are 6 unique Home Page layouts to choose from, along with 8 Shop Page layouts. These include Wishlist, Account, Cart, Shop List, Checkout, etc. If you’d rather start a Blog and sell on the side, that is also doable by using the specially-designed Blog pages. And then hop on to the About page and allow visitors to get acquainted with you and your site. Next it’s TSHOP by gtanim, a responsive template designed with cross browser support. It comes with more than 10 color schemes and 3 different header variations. There are over 80 HTML pages to work with and more than 5 slider variations, including a 5-step Checkout process. Product view is really interesting and offers you a variety of choices. Display them in a single-product slide or boxed together, it is all up to you. You can create different pages including Category, Collections, Sales, a Blog and any other you might need. Lastly, it comes with Parallax Story page and CSS3 Animations. By snstheme comes Simen, a clean and modern design that will beautifully display your eStore. Loaded with features and designed in a clean, well-documented code, this template has it all. If you prefer a simple site or one with numerous pages, hundreds of products and different collections, then look no further. There are 4 Home Page layouts, 3 Header and 2 Footer options, along with 4 Shop Page layouts. The latter will let you organize the products in grids, lists, add details and add them to the shopping cart. There are also 4 other pages you can add to your site, such as Blog, Contact Us and Error 404 page. Elegant in both design and color options, Hub by ondrique is a Bootstrap 4 template suitable for those who prefer a well-organized store. Everything will belong to a certain category that users can easily access, and ready-to-use Carousels will draw visitors in. The Mega Menu comes with multi-level dropdown and there are 24 page templates. These are all complete and ready to use right away. It includes a Product detail page, Shopping cart and also a 5-step Checkout Process page. This is a cross-browser compatible template and comes with SASS files included, if you’d like to kick things up a notch yourself. Bushido by 8Guild is a Premium template with 31 functional pages and 5 different Home Page types. More than 100 variations of online stores are included and they can be easily set-up with basic development skill and barely any effort. This is a template designed with structure and order in mind, with a fixed menu and compact search bar. You can easily search for any product, despite the device you are on. This bears mentioning as not only this is a fully responsive template, but it also lacks the horizontal scrollbar for all devices. It comes with the premium Master Slider and since it was designed with the help of marketing agents, there are some smart tricks implemented in it. Some of these are the calming colors, which helps the buyer focus solely on the products. With numerous other widgets included, if you are looking to set up your website quickly and without too much fuss, then give Bushido a try.